Aahhh…soup in the winter! 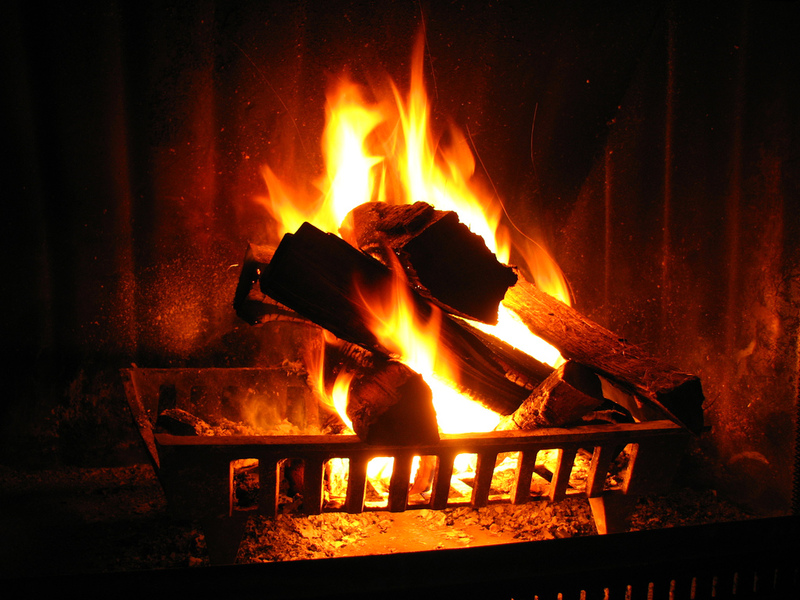 It just evokes warm feelings of sitting by the fire, cup of soup in hand, just enjoying the cold weather. …or just trying to fool ourselves that it’s cold outside here in Southern California. I have an elaborate mushroom soup recipe called Wild Mushroom Cappuccino that I got from the, now closed, Ritz restaurant in Newport Beach. I used to make it every year at Thanksgiving, but it’s quite expensive, with six different kinds of mushrooms, 3 cups of red wine and an abundance of other ingredients. It’s an amazing soup, but, besides being costly, it also takes hours to make, what with all the chopping and “cooking to reduce and thicken.” ….but I really like mushroom soup, so I decided to come up with a simpler version and it only takes about 20 minutes to make. Here you go…. 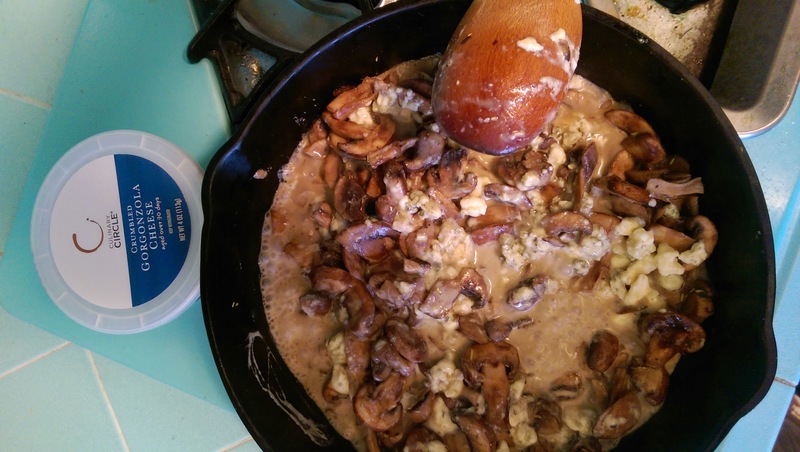 Melt butter in a sauté pan, add mushrooms and sprinkle with rosemary and a bit of garlic powder. 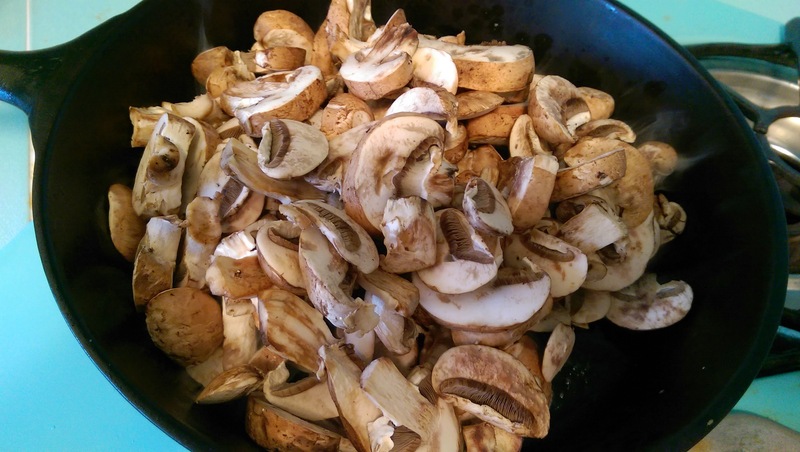 Cook until the mushrooms have “sweat” and are a nice dark brown color. Throw in the ½ container of gorgonzola…sometimes I add more than ½…and cook until the cheese is mostly melted. Let it cool a bit. 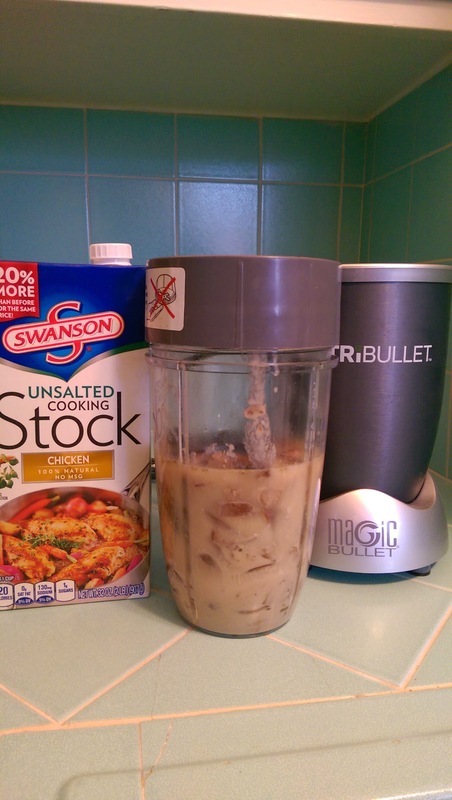 Take about ¾ of the mushrooms and put into a blender or nutra-bullet (my new personal favorite kitchen toy!) and add 1 can chicken stock/broth. Puree. It will thicken as you puree, but if you want it thinner just add more chicken broth. Add back in the remaining ¼ mushroom pieces from the pan and voilà, you’re done. Heat up in the microwave. Sometimes I add a bit of cream if I have it. I add salt to almost everything when cooking, but the gorgonzola makes this plenty salty, so no need. The elaborate Wild Mushroom Cappuccino is really delicious…message me if you want the recipe…but this one is so easy and sooooo yummy with the addition of the gorgonzola. …OR for a really simple soup, just pick this up at Trader Joe’s in the freezer section and pop it in the oven..SO GOOD! I’ve been enjoying a lot of traditional French onion soup here in Canada..but this is a good stand in! 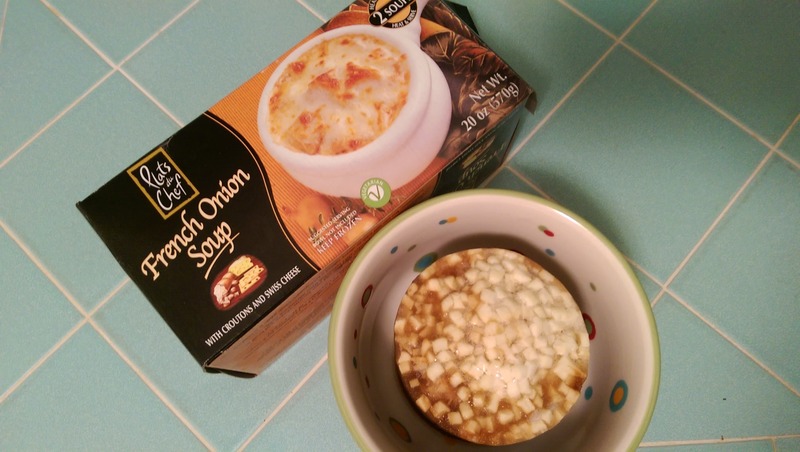 Trader Joe’s frozen French Onion Soup…SO GOOD when it’s done…this is just the before in it’s frozen stage!